Shh shhh. Here comes Todd. Are you serious? That guy is driving me insane. Hey guys! Let's call some FOULS! Fouls, guys! Let's call 'em. (whistles) Illegal strutting. (whistles) Excessive sweating. This is SO MUCH FUN! 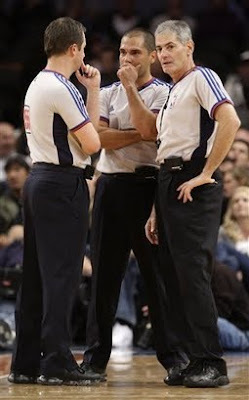 This is the exact opposite of the refs in my basketball league that i play in. the refs don't call $%#@! because they want the clock to run down and they can call it a night. bastards!